This talk introduces concepts, theories and methods of Creativity as a systematic process to foster learning and Innovation. Following a multidisciplinary approach, systematic Creativity practices, like design thinking, use a set of tools and methods to solve problems and attend needs, through the combination of multiple experiences and perspectives. Culture and training in systematic creativity and innovation is essential in the creation of good learning environments and outstanding communication. It is contemporarily acknowledged as a competitive advantage to a wide range of activities and organizations as a way to increase both performance and productivity. 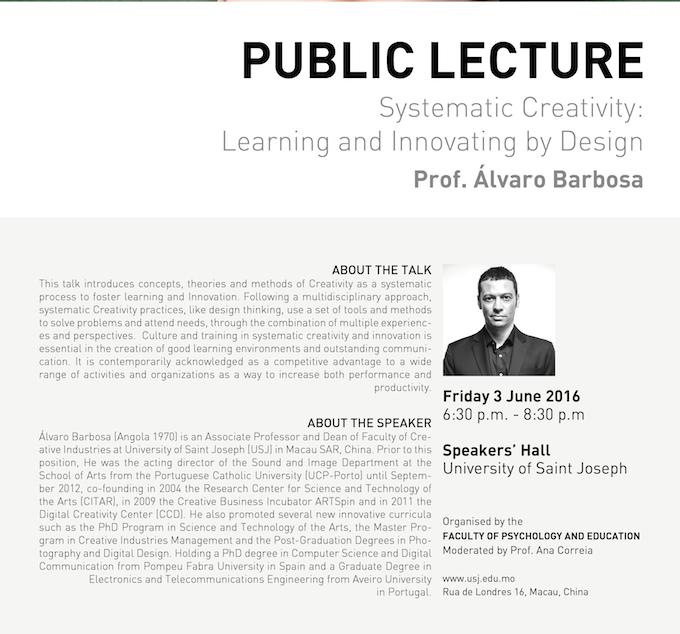 Álvaro Barbosa (Angola 1970) is an Associate Professor and Dean of Faculty of Creative Industries at University of Saint Joseph (USJ) in Macau SAR, China. Prior to this position, He was the acting director of the Sound and Image Department at the School of Arts from the Portuguese Catholic University (UCP-Porto) until September 2012, co-founding in 2004 the Research Center for Science and Technology of the Arts (CITAR), in 2009 the Creative Business Incubator ARTSpin and in 2011 the Digital Creativity Center (CCD). He also promoted several new innovative curricula such as the PhD Program in Science and Technology of the Arts, the Master Program in Creative Industries Management and the Post-Graduation Degrees in Photography and Digital Design. Holding a PhD degree in Computer Science and Digital Communication from Pompeu Fabra University in Spain and a Graduate Degree in Electronics and Telecommunications Engineering from Aveiro University in Portugal, his academic activity is mainly focused on the field of Design foir Audio and Music Technology, in which he worked for five years as an Resident Researcher at the Barcelona Music Technology Group (MTG). His recent R&D work, on experimental Network Music and Interactive Sound-Design Systems, was largely fostered in 2010 during a Post-Doctoral Research Position at Stanford University in the Center for Computer Research in Music and Acoustics (CCRMA). His projects, in collaboration with other artists and researchers, have been extensively presented and performed internationally, with special emphasis in Sound and Music Design pieces, Collaborative Interactive Installations, Live Electronic Music, Computer Animation short-film, Design Thinking and Systematic Creativity.